"The winds pushed at the house, but the young trees kept it from falling apart, and as they grew bigger and stronger, they held it together as if it was a bird’s nest in the fingers of their branches." When children grow old and families change, some things get left behind. When a family home is abandoned, however, wild maple, elm, ash, hackberry, and cottonwood trees band together to lift and support the memories and seeds in this home that will never be forgotten. Two-time U.S. 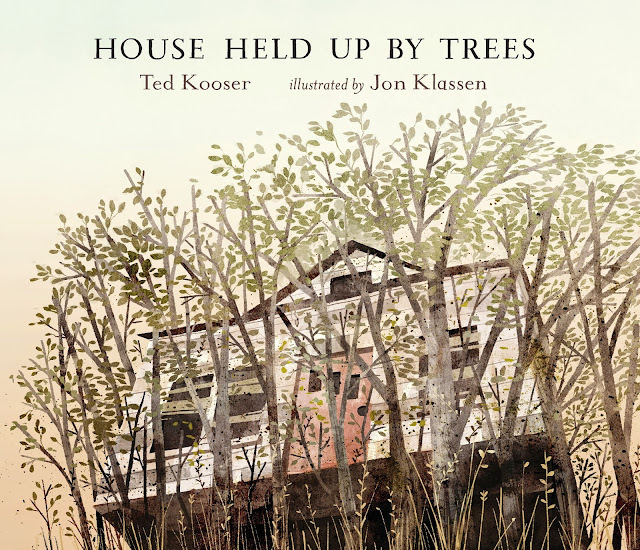 Poet Laureate Ted Kooser’s picture book is a deeply beautiful and profound tribute to home, family, loss, nature, and the power of the future. The lovely language and vivid imagery in his picture book—along with Jon Klassen’s beautiful illustrations—capture a child’s imagination while striking at the heartstrings of older audiences. Kooser’s story leaves readers feeling inspired and strengthened by the powerful roots of these unfailingly faithful trees.